If only I was born in the year 2000….. 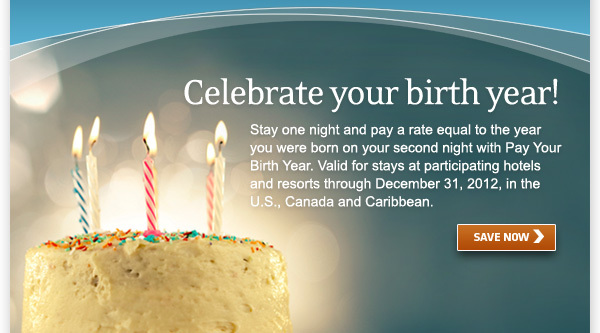 While I believe it has been around for some time, Starwood is again advertising their “Pay your Birth Year” promotion for multiple-night stays. Your rate will the first night will vary by property, then the second and third nights of your stay this promotion will kick in. *Some exceptions may apply. Length of stay requirements may vary by participating hotel. Please see participating hotel for details. **Second (and third) night rates will be confirmed at check-in with valid date of birth identification. Basically, some of Starwood’s properties will require $100 plus your birth year. ($186 for me, since I was born in 1986) Which is steal I very good deal, especially for properties like the W Chicago. I have seen this promotion before as I mentioned, but I have never gotten in on it. I am able to me to receive government rates, so it usually saves me more than having to pay the full rate for the first night. Still, I am sure this could prove very valuable at some of their more upscale properties and large urban areas, where even the government rate is sometimes steep.